Within hours of publishing my article reacting to Yahoo's reversal of a longstanding work-from-home policy, I was engaged in a lively debate with a law firm managing partner regarding the benefits of a distributed workforce. He posed a simple question, one that I didn't fully address in my earlier article: Why would a law firm allow any employees to work offsite when collaboration and, more importantly, instant availability when clients call, is so critical? 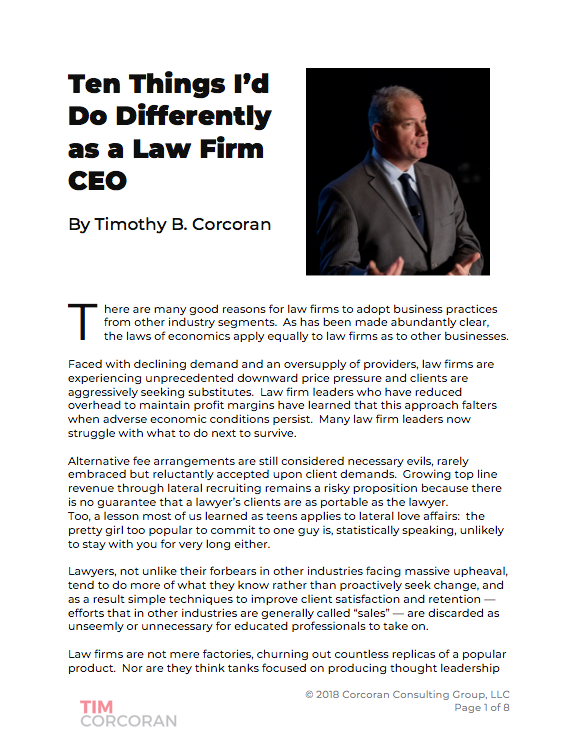 Interestingly, many of his points mirrored those of another law firm managing partner from a separate discussion last week who scoffed at the mere notion of using contract lawyers or outsourcing in his firm, for fear that quality would suffer. The two issues are very much related and I appreciate the opportunity to connect the dots. Companies are in the business of making cars or furniture or software or bed linens or rust-resistant rivets used on ocean liners or x-ray film or lunch meat or ships in bottles or countless other offerings. Most businesses find forays into non-core areas dilutive to earnings, so they hire others to mow the lawn at the company headquarters and manage the company cafeteria or make the coating that they apply to the rivets and so on. Every business eventually encounters a need for legal advice yet few have lawyers on staff. And those companies with enough scale to have in-house lawyers generally hire quarterbacks to manage outside specialists rather than to hire one lawyer for every specialized legal need they might ever encounter. In a word, the legal needs are outsourced -- first to in-house counsel, when available, and then to outside counsel. The primary reason for existence for most, if not all, law firms is to serve as an outsourcing provider to clients who do not have and do not want to maintain this function as a core competency. So the law firm leaders who immediately dismiss outsourcing as a tool in their own arsenal are short-sighted. If it weren't for outsourcing, many lawyers would not be nearly as gainfully employed. The reason outsourcing works is a simple economics term: carrying costs. There is a recurring cost to establish and maintain any function, and some services are needed frequently enough that incurring this cost as overhead is more desirable than hiring one-off experts. But not every business reaches the same conclusion for each function. Some hire salespeople, others use third-party channel providers; some hire accounts receivables clerks, others rely on an outside agency to perform this task; some hire a full-time marketer, others bring in experts on an as-needed project basis. Sometimes this "make vs. buy" decision is straightforward, other times the addition of an FTE (full-time employee or equivalent) is a big deal that requires deeper analysis. Yet many law firm partners, especially in Biglaw, have become enamored with the idea of the "instantly hot" water supply -- you know the kind, no matter which faucet or what time of day, the moment you turn it on you get hot water without delay. "The ability to mobilize instantly and staff a complex matter literally overnight is our greatest asset," reported one law firm leader in an interview I conducted several years ago. In layman's terms, law firms are like the supermarket with 20 checkout lanes, with every lane staffed and open at all hours, every day, all year, regardless of demand, just in case a client might call. Upon closer inspection, however, we might find the law firm's checkout lanes staffed by guys who normally collect shopping carts in the parking lot, stockroom clerks, butchers and bakers, in addition to specially trained cashiers. This is the result of hiring untrained associates and making them available as a general resource to any partner that needs a body. We've all been frustrated when forced to wait in line at a supermarket, everyone crowding into three checkout lanes while 17 remain closed. While this memory is vivid, the statistical reality is that we rarely face this delay at our busier stores because they employ statistical modeling called "queuing theory" to estimate peak and slack times, and they staff accordingly. No supermarket would be profitable if it incurred the carrying costs of staffing every checkout lane at all hours, and it would be similarly unprofitable if it constantly forced buyers to wait, which would drive buyers to seek alternatives. What does this mean for our law firm leaders? Clients do indeed call and request assistance on a moment's notice. But why not explore a model that allows the firm to quickly access scores, even hundreds, of well-trained, specialized, experienced lawyers, some of whom are nearby, some of whom are remote, all of whom are connected via high-speed Internet access to phones, computers and possibly video, but who prefer not to embrace the daily life of a Biglaw associate? The carrying costs of the combined salaries, benefits, real estate, equipment, subsidized food and late night transportation of associate employees are enormous compared to the $0 carrying cost of for contract lawyers. In some cases there will be higher transactional costs ramping up contract lawyers, but as the outsourcing providers have demonstrated beyond any doubt to in-house counsel who regularly hire them, the higher up-front cost is more than recovered by improving the quality of the work product and the reduction in repetitive rewrites, among other factors. And, by the way, the traditional associate locked in the library for hours on end conducting research isn't collaborating as much as we think she is. Now, before the ATL crowd overreacts, I'm not advocating the elimination of associates on the law firm payroll. But I am suggesting that many of the unhappy and unproductive associates who are on the payroll today would enjoy doing creative and challenging work from the comfort of their own home office, without the many distractions incumbent in working every day in a law firm, especially if making partner isn't in their future. It's simple economics. Savvy law firm leaders long ago recognized the wisdom of outsourcing non-core back office functions. The progressive leaders have begun to embrace the use of work-from-home lawyers, contract lawyers and outsourcing firms to provide "instantly hot" services with lower carrying costs, and found that this approach can provide access to greater experience and more productive lawyers too. Whether or not you embrace a work-from-home policy that reduces your overhead while increasing productivity, or establish a network of contract lawyers to serve on a moment's notice, or contract with an outsourcing provider to fill specific needs on an ongoing basis, is a decision only you can make and only after reasoned analysis. You can cling to the notion that quality only results from the Ivy League-to-Biglaw-partner-track staffing model, and you can cling to the notion that 20 open checkout lanes at 3 AM is a wise allocation of resources, or you can apply some established business analytics to your own enterprise and make informed decisions. The choice is yours... until your clients make the choice for you.